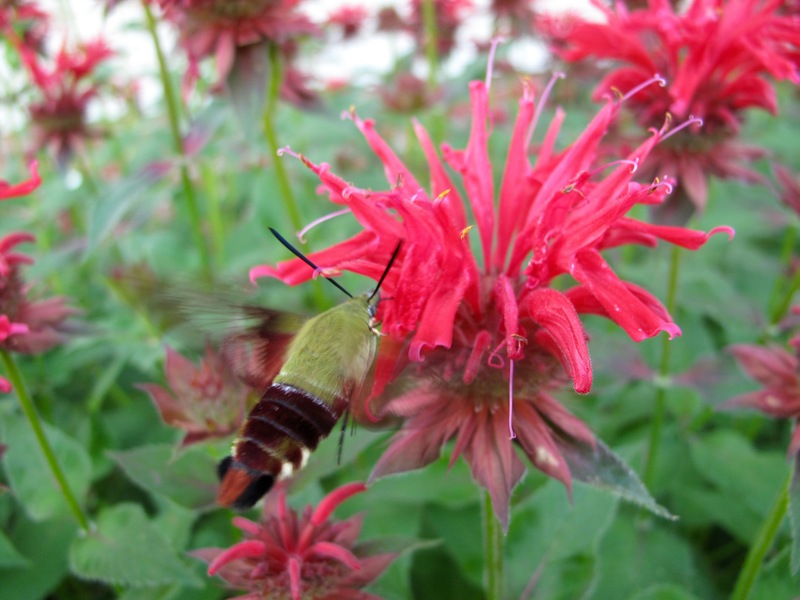 A Hummingbird Moth was attracted to the scarlet flowers of Monarda didyma yesterday morning. I did not notice there actually were two moths until I saw the photograph below. The garden at mid-June is hanging on by a thread, or rather hanging on by a hose. 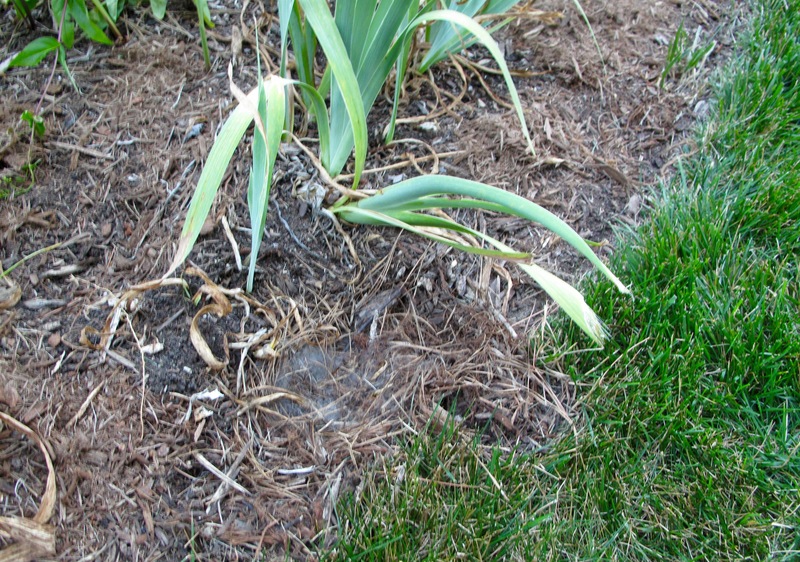 If not for early-morning watering many plants would be crispy and brown, the way the grass is becoming. Fortunately a few things, like Monarda, are tolerant and seem to manage fine. Rain would help, but with none in sight, heat is the main story this week. Today it is already 95°F/35°C at mid-afternoon. Expected highs on Monday and Tuesday are 98°F/36.6°C and 99°F/37.2°C—unusually severe for this early in the summer. 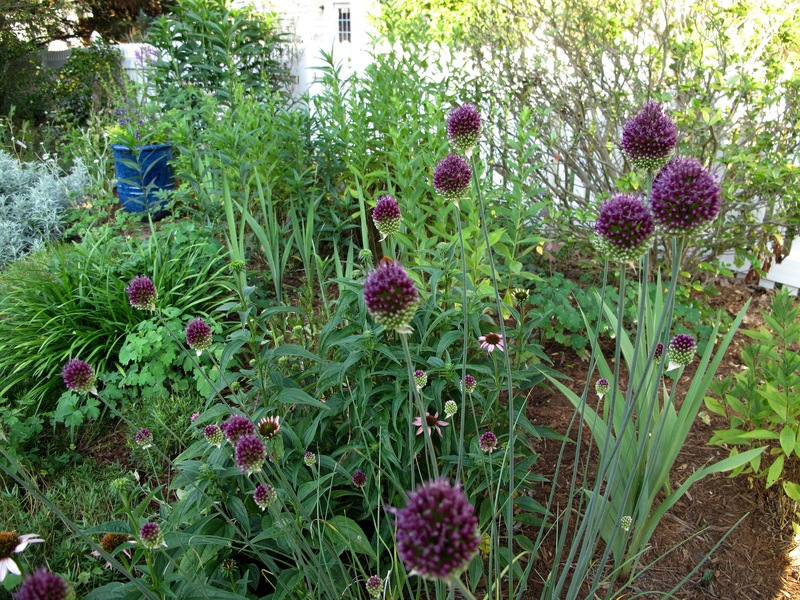 Alliums are generally short-lived in my garden but this group of Allium Atropurpureum has managed to return for the past couple of years. 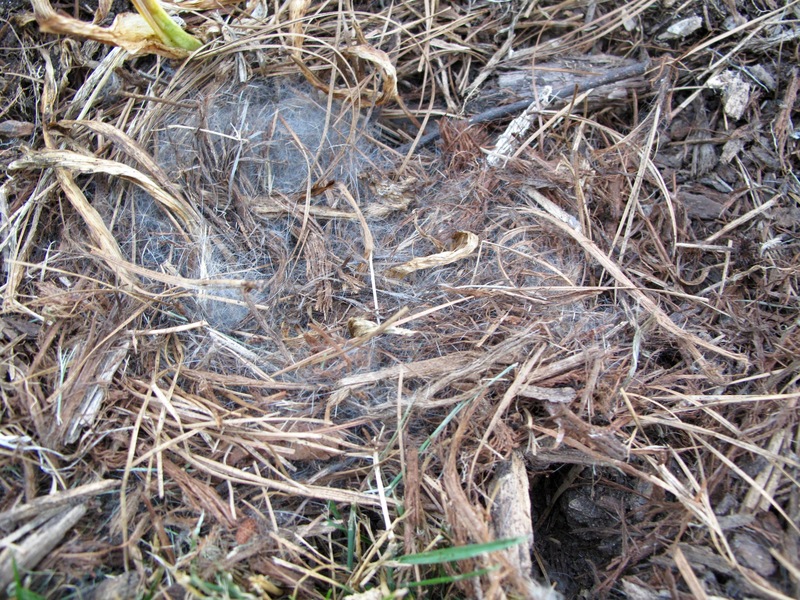 Last night I made an unexpected discovery on the back side of a border, a rabbit nest I think. Never identified much with Mr. McGregor and I will not be running around with a hoe, but I am definitely keeping the little blue velvet jacket if Peter snags it on the fence. 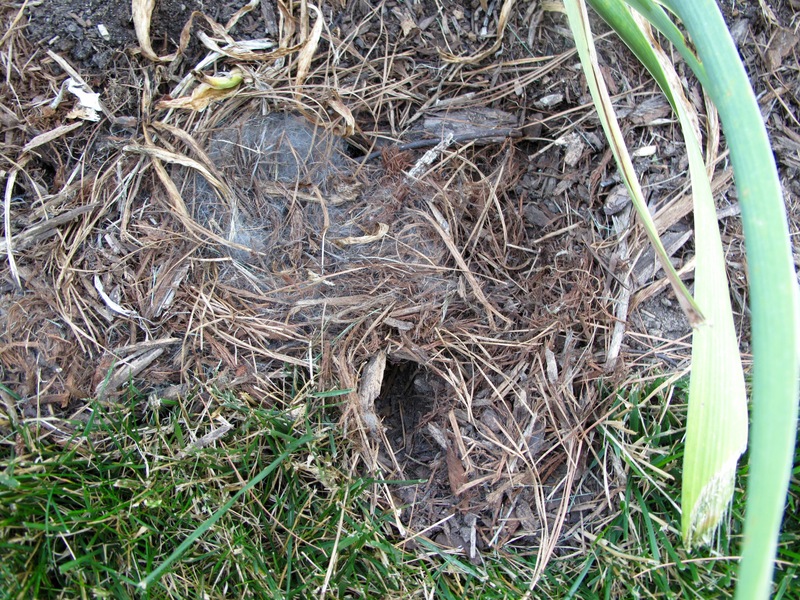 This entry was posted in garden and tagged Allium, almanac, garden almanac, Monarda didyma (Scarlet bee balm), rabbit nest on June 14, 2015 by pbmgarden. Good shot of it! It is not easy to take a good photo of it because it is flying so fast! Thank you–it was in a bit of a hurry, but there were so many flowers for it to try that I had time to get a few shots. The hummingbird moth is saying that your garden is a good place to be, how wonderful to have them visiting! Yes, it is nice Pauline. I’ve not seen many before, usually later in the summer I see one on the lantana. Lovely photo – hope to see one of you in the blue jacket as well! Cathy, I’ll keep you posted on the blue jacket. Looks like we are both “enjoying” rabbit season. Alas. Hope the rabbits in my yard don’t read your list of what’s tasty. Gosh that heat sounds draining….lets hope you get some rain soon. I know how exhausting the morning watering ritual can be! Yes, that’s a good word for it Matt–draining. Being outside early to water has advantages too–nice to enjoy the garden when it’s nice and quiet out. Thanks Judy. Amazing anything can keep going in this heat. Hope you and your little bunny get some rain soon. Great photo of the hummingbird moth! Your Monarda looks somewhat like my Monarda ‘Raspberry Wine’, one of my favorite plants. Thanks Jason. I think I’ve seen a darker red in my neighborhood, perhaps Raspberry Wine — very elegant. 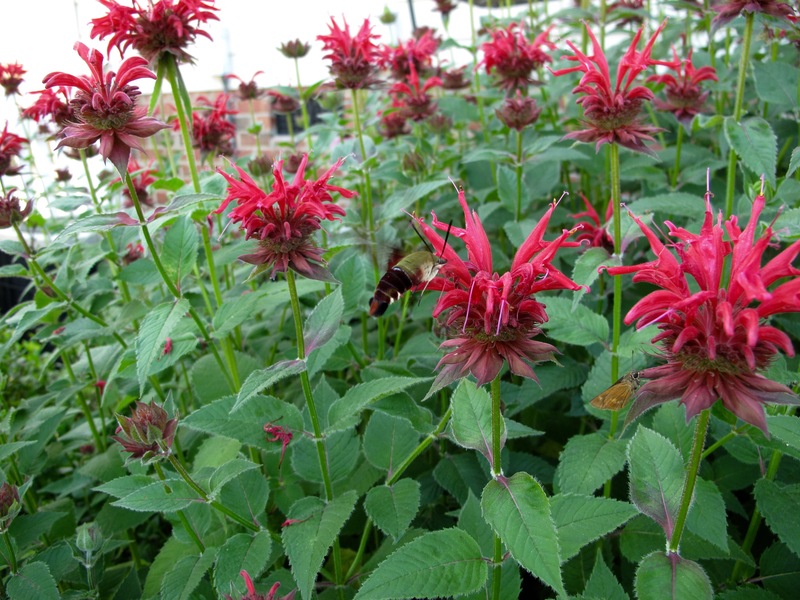 This one is just the plain old Monarda and it’s hard to plant anything with it that complements that red color. Loved your gorgeous garden photos and special discoveries; such wonderful treats to bring a weekend to a close. Glad you took time to stop by and see the garden pictures tonight Charlie. Hope the week ahead is a good one for you. The hummingbird moths are magical creatures and you got a good shot there. I shall be running around with my camera to try and capture some of ours again this year… they are so fast! I love the red Monarda flowers but gave up on them here after mildew got them. I hope yours continue to stand up to the hot weather. It’s been scorching here too, but this morning is cooler after an overnight shower. Cathy, the hummingbirds moths are amazing. I’ve enjoyed seeing them on your posts. We don’t come across them often so it’s a treat to catch one up close. Powdery mildew is always a problem with the Monarda here too. That overnight shower sounds wonderful–glad you got a little relief. Oh Wow Susie, lovely photo of the Hummingbird Hawk Moth, we rarely see one here. You seem very calm about your rabbit nest, do you mind them in your garden? I hope you get some cooler temperatures and rain, that does sounds hot! Thanks Julie. There usually is a rabbit or two each year but this is the first time I’ve seen a nest. Not sure if I should be more worried but am serenely calm so far! This weather is putting my attempts at xeric gardening to the test. I don’t think I can hold out much longer before dragging out the hoses. Sorry you’re having dry weather there too Rickii. At some point even the most drought-tolerant plants need a little drink. It takes an exceptionally warm summer for us to get Hummingbird Hawk Moths but we wait in anticipation every year just in case. They are such stunningly beautiful creatures. That’s interesting Malc. It’s been blistering hot here, much earlier than normal. I thought it seemed early to be seeing one, but maybe it’s because of the heat. Good luck this year in spotting them. Lovely photos and a lovely color Monarda too. I hope the rabbit hasn’t done much damage to your garden. I used to let them hang around on the lawn but since they’re getting too comfortable lately (eat my seedlings on the patio) I started chasing them out. Mama rabbit was on the lawn this morning and i’ve spotted a little tiny one several times while watering. Oh you will have fun with the rabbits….momma will be nursing at dawn and dusk and the babies will be out and about 4 weeks after birth and then out of the nest 3-4 weeks later…so if you see baby rabbits well keep an eye on them as they like to sample many things. I have lots of clover to satisfy them now so they stay away from the plants.